... The new shape balances perfectly over the right leg, orienting the neck parallel to the floor. It's effect on the sound is to give the bass a cleaner, less muddy sound than most dreadnoughts, rich mids and crisp highs. I reshape the guitar’s bridge and internal braces into flowing shapes that speed the vibrations from the strings into the top, and to balance the string tension at any point on the braces. If a brace is stronger than needed, it will dampen the soundboard where it is glued underneath. I have found that most of the braces in the guitar are too heavy and keep a lot of pretty wood from vibrating the way it would like to. I have written two articles on this subject which were published in the Guild of American Luthiers magazine, ‘American Lutherie’ (#47, Fall, 1996 and #66, Spring, 2001). Copies of the magazines are available from the guild at www.luth.org. I will be glad to send copies of my articles to anyone who sends me a S.A.S.E. I have also given workshops at two GAL conventions, in 2001 and 2006. Scott performs on a regular basis throughout Grant County, NM. His solo blues style is rich and entertaining. He often tries out recent builds in front of live audiences to ensure their quality. Excellent++ condition 2002 model by Scott Van Linge in Silver City New Mexico. 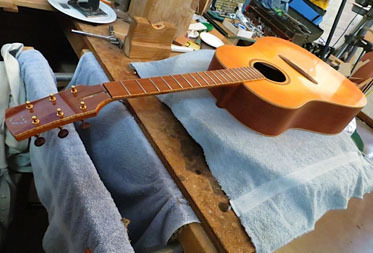 The Van Linge guitars are reminiscent of Don Musser guitars, with whom he worked. Scott established himself as the go-to guy for re-voicing tops to give them more dynamic response. This guitar has a strong voice, well balanced and articulate. 1 11/16" nut, 24 5/8" scale, 2 1/8" spacing at saddle. 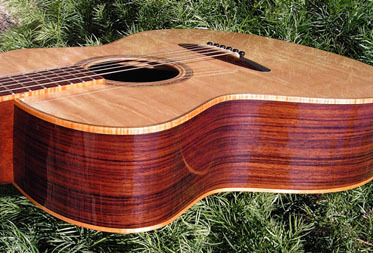 Indian Rosewood with Sitka, Maple binding. Schaller tuners. Contact Scott directly for details on this beauty. The sound, as expected, is exceptional. Scott van Linge first shared his experience and theories about brace shaving with me back in l995... Since that time I've had an opportunity to play and listen to (both before and after) numerous guitars by various makers such as Taylor, Martin, Gibson, Larrivee, Thompson, and Collings that he has reworked to improve sound and playability. I have also built two guitars in collaboration with him that were braced according to his 'parabolic bracing' theories. As both a player and a builder I've been very impressed with the results of Scott's work and ideas." 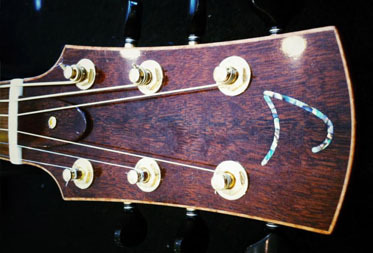 "Dear Scott, I am writing you regarding the work you did on my 1976 Martin D-28. When we observed the Thanksgiving Holiday this year, I literally listed my guitar and its modifications as something for which I was profoundly thankful this year!...I was pleased with our initial phone conversation and the patient, interested, detail-oriented way that you discussed the procedure. The very mechanics of packaging up my favorite acoustic and shipping it across country were new and somewhat intimidating to me. 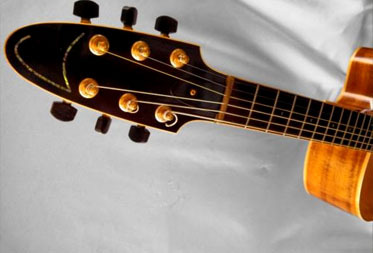 As I explained to you,...I am very far from the level of guitar owner/collector/musician you may often deal with....the money was an issue for me; and the modification of a factory stock D-28 in otherwise decent condition was a serious step. In my life, there are all too few examples of work that generates excitement and interest, and leave the lingering notion of money well-spent! I remember specifiying that I was particularly interested in response, resonance, and sustain. The brace work and bridge work seems to have addressed these properties. The improved response means it is easier to play and that a light touch produces a suprisingly sweet tone. The guitar vibrates much more noticebly and the sustain is remarkable. Scott, your workmanship is obviously neat and careful. There seems to be virturaly no tool marks or areas where the surfaces, finished or unfinished, give a clue to what has been done..."
"Scott, I can't thank you enough for the incredible work you performed on my guitar [Gibson Heritage]. Your craftsmanship and attention to detail go above and beyond the norm. 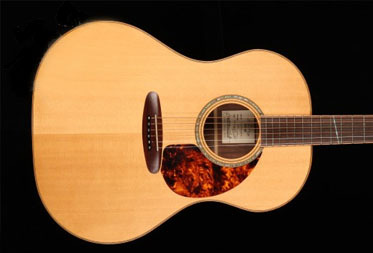 I am very proud of my guitar and the tone and playability far exceed what I expected." 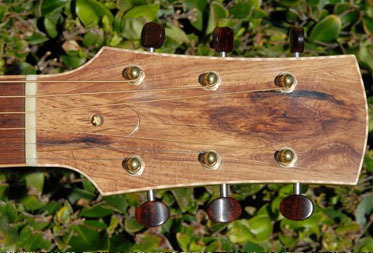 Scott Van Linge guitars are known for their unique “parabolic” bracing system, and full, rich vibrant sound.